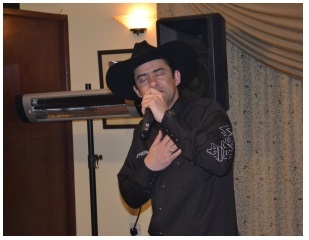 Al Shaheen in Karakum saw the return of Devon (Mr Rodeo) on Thursday 14th March following an anniversary event the previous week when there was a packed house. 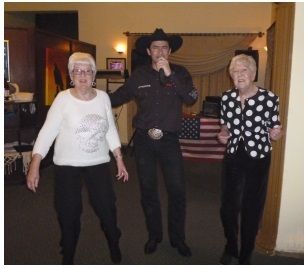 This week there were a good number of diners looking forward to seeing Devon perform his excellent country music and having attended last year when he entertained us, also with some of the Phoenix Line Dancers showing us how it is done, we were all looking forward to the evening. When we arrived we were greeted by Steve and Denise Bisson who founded the Phoenix Line Dancers. 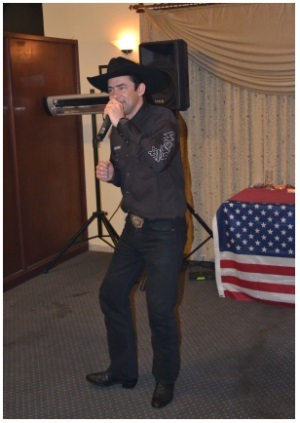 T hey are very good friends of Devon and he comes over to North Cyprus to spend some time with them for some relaxation but inevitably he is asked to do a bit of entertaining as well by some of the people who have come to enjoy his style of country music. Devon told me he was departing the next day but hopes to return again later in the year. We ordered our drinks and meals and while we were enjoying the food Devon started singing. 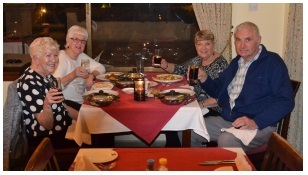 When we had finished our meals we were able to sit back and relax and enjoy the entertainment. As there were no other line dancers there that night, my sister and I were persuaded by Denise to get up with her and “have a go” to a particularly good line dancing song, not very well done by me I must admit. Later in the evening Denise tried hard to persuade us 3 ladies to go along to their line dancing classes, so maybe it might be worth a try, a little exercise will probably be a good thing for all of us, even though I think my co-ordination is a little lacking. If I decide to go along I will be able to write something to let other people know how someone with “two left feet” adapts to line dancing! Devon continued with his songs throughout the evening and a few people got up to da nce. At one point Devon suggested he sang the “Al Shaheen Song” this was Ring of Fire! very appropriate for their hot curries. It was a good evening with a nice meal and excellent entertainment which finished with one of my favourites “The Devil went down to Georgia”. Well done Al Shaheen and Devon for a lovely evening. 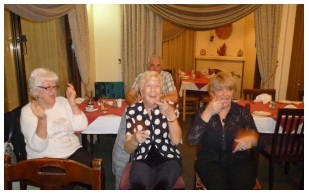 Recently Devon was at a Mothers’ Day event where he was joined by a group of Cypriot people who persuaded him to try Turkish dancing and he certainly seemed to be enjoying it in the Youtube clip below. This entry was posted in Media reports, Special Events and tagged Country music, Devon, Line dance, Mother's Day, Northern Cyprus, Youtube by kyreniacatkin. Bookmark the permalink.